June 21, Father’s Day, was a happy day for Wu Chun (吳尊), who celebrated the special day with his 6-year-old daughter Neinei and 2-year-old son Max. “This is the happiness I chose,” wrote Wu Chun on his Weibo. “To all the fathers in the world, let’s add oil together! Happy Father’s Day!” He uploaded three photos of himself with his two children, eldest daughter Neinei and son Max. This marks the first appearance of Max, who was born in October 2013. 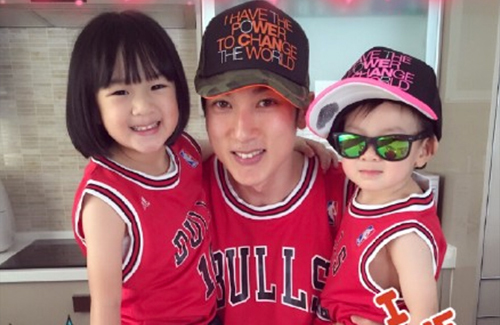 Wu Chun leads a very private life and rarely shares photos of his family. Though he has been married since 2009, the Bruneian actor did not reveal his marriage and family to the public until 2013. Is it just me that I find him look a bit feminine here with the cap? But he always looks feminine doesn’t he? @shaniquawilliams I thought so too! i thought i was looking at Linda Chung with 2 kids.